Now you have an opportunity to find errors in measurement techniques. This first activity involves looking at an image. What error in technique is this healthcare provider making while taking the temperature of an adult client? 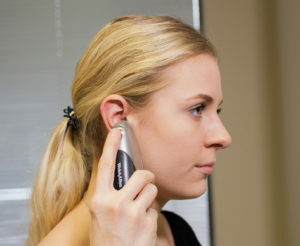 Go to the next page for information about the correct technique in measuring tympanic temperature. Finding the Error Activity: Tympanic Temperature by Ryerson University is licensed under a Creative Commons Attribution 4.0 International License, except where otherwise noted.